If you've seen The New Yankee Workshop on PBS, I think you'll catch the pun. Just so that folks don't get the wrong idea--Yes I'm Chinese and no, I don't mean the title of my shop/website to be derogatory in any way. My given Chinese name is "Ching" and my last name is "Ky." For as long as I can remember, my family has called me "Chinky" (Ching-ky). It's meant affectionately, and yes, you'll have to have my permission first before you can call me by that name. So for everyone who I have yet to meet, Just call me Ray. So how did I get started getting into woodworking? It all started with Thomas the Tank Engine. My nephew was and still is quite obsessed with trains. He started with a small collection of these highly overpriced Thomas the Tank Engine toys. I was looking at the Thomas the Tank Engine catalog and saw a train table being sold for over $200!!! I couldn't believe it and decided I'd try to make one. I had no prior experience woodworking and I never did take woodshop. I bought myself a hand saw and got some wood and that's where this whole thing started. I used to make fun of how Norm Abram (the host of the New Yankee Workshop) had an unholy amount of power tools and corporate sponsors. Unfortunately or fortunately (depending on how you look at it), I wound up having a set of machines that's slowly catching up to Norm's collection. But one thing is for sure, I won't ever wear plaid like Norm! My Dad passed away this past December. It happened pretty suddenly, but we were fortunate enough to spend a good two weeks with him before he passed. I'm so thankful I had a chance to tell him that I love him and that he will always be with me. He was in the hospital for about a week and we nearly lost him several times there. He just wanted to go home and so we took him home for hospice care. I will never forget the big smile on his face and the excitement he showed when he finally arrived home. The first thing he said to us when we got home was, "The swimming pool water level is low...you guys need to add more water." That was my Dad. This is a photo of him enjoying a piece of guava fruit from his favorite guava tree. I still remember him obsessing about the birds pecking at his guavas. He used to wrap up each fruit with a plastic bag while the fruit was still growing on the tree to keep the birds away. It looked pretty ridiculous at the time, but it worked. That's how much he loved his guava. I love this picture, as this was the last time he was able to eat a piece of his guava fruit while admiring the tree that he planted years ago. I'm glad that I was there to share this moment with him. In the past, whenever my Dad would come home from the hospital, he would stop in the front living room to pray to and give thanks for being able to get home safely. My dad's house has some steps to it and is not wheelchair accessible. Unfortunately, when he got home from the hospital this time, he couldn't really walk and consequently was pretty much confined to the back part of the house. 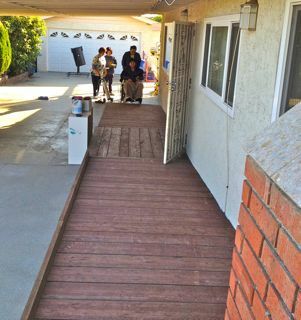 With the help of my nephew and two of my brothers in law, we were able to build a wheelchair ramp in two days in between all the different trips to the hospital. Watching how my dad's health was deteriorating was the most helpless feeling I had to endure. I guess building this ramp was my way of doing something for him...just a little anything to thank him for everything he did for me as a father. It felt really good to build this ramp. 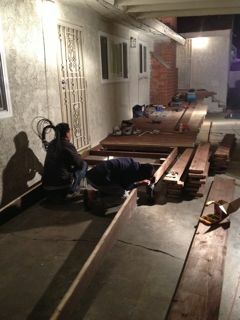 When it was finished, I pushed him up the ramp and he was able to give thanks to Buddha and say his prayers. It filled my heart to see him pray and see him make peace before he had to leave this world. He was able to use this ramp twice before he passed away. I miss you Dad. Thank you for everything you did for me and for supporting me in whatever I did. I hope I made you proud. I love you and you will always be with me in my heart. So take a look at this site, I hope you enjoy the photos and some of the stories I have to share. 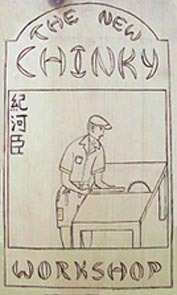 Click on the links on the top left hand side of this website and have a look at The New Chinky Workshop!